Elizabeth Blackburn discovered a treasure, a secret of renewal that keeps cells young. Can it stop the grey hair, the wrinkles, the aches and pains? Can it prevent disease? Can it stop cancer? A ‘challenged’ muso takes his music out to the world, a wolf-man finds his pack, a 42-year-old woman lives her life as a child, a mother of three makes a new perfect virtual family and a grandma becomes a supermodel. As the popularity of virtual worlds explode Alter Ego weaves in and out of both the real and virtual lives of a cast of fascinating characters in the virtual world of Second Life - a world that gives people a platform to explore their darkest desires. Australia on Trial is a three-part docudrama that will be screened on ABC TV. Each episode tells the story of a famous Australian court case, drawing directly on historical documents to show that truth is indeed stranger than fiction. All three epic trials changed the course of Australian history. The “Carbon Cops” Sean Fitzgerald and Lish Fejer demonstrate how awareness and technology can be combined in simple and practical terms to help people reduce their own carbon footprint and tackle the problem of greenhouse gas emissions. Each episode features one household that have their home’s structure, appliances, vehicles and habits assessed for energy efficiency. The families are challenged to make physical and lifestyle changes to significantly reduce their energy use. A fast-paced investigation of a provocative idea, Catching Cancer features world experts, Nobel Laureates and virus hunters on the front line. Voyaging deep into the mysterious cellular world of cancer, the film demonstrates how cancer begins and what factors rig the ‘cancer lottery’s’ lethal odds. Combining intimate personal stories and intriguing science, Catching Cancer reveals how finding a hidden trigger, such as a virus, is not a reason to panic; it’s a reason to celebrate. Chris Humfrey is a zoologist who lives with his young family and their REALLY big dog in an idyllic bush haven in country Victoria. But the Humfreys also share their home with a few other pets – more than 2000 and each one of them needs care and attention 24/7. This isn’t your average family home. It’s a private zoo where human and animal sagas unfold on a daily basis. Chris and his wife Nicole work around the clock to keep their very extended family happy and healthy and manage their enthusiastic crew of Gen Y zookeepers/presenters. Each week Chris shares with us this extraordinary life and his amazing knowledge of Australia’s fauna. Follow Chris in this chaotic, animal-crazy series that captures the drama, the danger, the animal antics and the sheer exhilaration of Chris Humfrey’s Wild Life. Every day, a new saga unfolds at the zoo. Every day there is something new to learn – even for Chris. Captain Cook, Obsession and Discovery is a series that is part biography, part travelogue. Cook expert and best-selling British author Vanessa Collingridge takes viewers on a journey around the world, filled with high adventure, triumph and tragedy, as she searches for the man behind the legend. Family Footsteps Series 1 & 2 creates a sliding doors experience for a group of diverse young people by returning them to their migrant parents’ homeland. Faced with challenges and surprises along the way, these intrepid explorers live as locals, experiencing how their lives could have been today if fate had taken a different course. Their journeys take them to Ghana, Peru, India and Egypt. As they explore more about their connection to two countries, they find out more about their family, culture and about themselves. Revealing Gallipoli gives the full story of what happened on Australia’s most revered place of battle. For the first time, Revealing Gallipoli tells these stories from the perspective of many nations that fought there. Three presenters, an Australian, a Turk, and an Irishman, roam the battlefields and tell us the stories of what happened. With the use of unique three-dimensional photography and maps, and the extraordinary words and images of the young men who fought there, Revealing Gallipoli brings the battle alive. Grey Nomads tells the stories of older Australians who are chasing their dreams and discovering a whole new world. There are thousands of Grey Nomads travelling around Australia, and 62-year-old Mary Mason meets many who shape her thoughts and ignite her imagination. Some have fallen in love all over again and rediscovered romance, some take chances by opting for the adventure of journeying to remote places, others struggle to let go of the past and embrace the unknown road ahead. This documentary tells the stories of a few of these people – Grey Nomads – and their travels through new landscapes in search of a new life. Their stories are full of humour, wisdom and optimism and are an inspiration to us all. There are more people in the world today over 60 years old than there has ever been before. They are living in their "Third Age" and despite their rapidly increasing numbers, there are few older "role models" to whom they may look for inspiration... Until now. 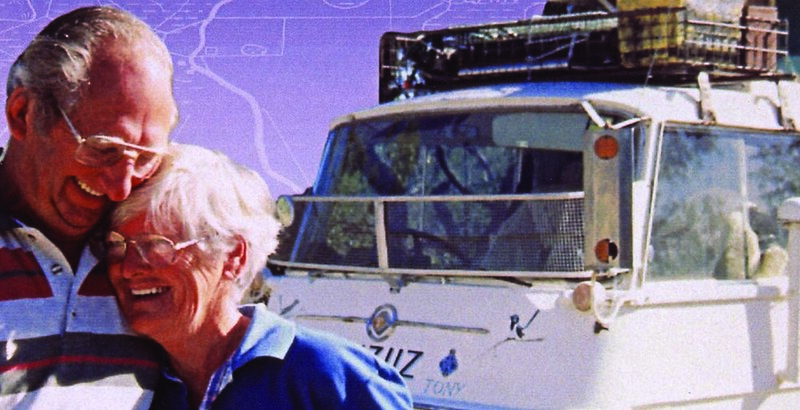 Grey Voyagers is a unique six-part travel and adventure series, featuring the remarkable stories of six ordinary "older people" making extraordinary journeys to far-flung parts of the globe. Their adventures takes us to the frozen Antarctic wilderness, across the broad expanse of the United States, motorcycling through the spectacular vistas of Nepal, sailing among the lush tropical islands of the Caribbean, into the ancient landscapes of Northern Iran and the devastation of East Timor. These "Grey Voyagers" have inspirational stories that challenge traditional "stay at home" stereotypes of ageing, and celebrate the amazing possibilities all of us can look forward to in our "Third Age". Out of the Ashes is the story of nature’s resilience in the 12 months following the catastrophic bushfires that tore through Victoria, Australia, killing 173 people and destroying more than 2,000 homes. The fires incinerated swathes of prime forest and its wildlife. But fires are a natural process and these mountain forests need fire to regenerate. Even in the face of overwhelming devastation, plants and animals have an uncanny knack of bouncing back, and the environment has an extraordinary capacity for healing. Out of the Ashes examines the drought leading up to the fires, the ensuing fires and the ecological recovery over the next 12 months through the first hand experiences of people who were involved. Scientists, rangers, animal care workers and people who escaped the fires describe their experiences. The Extraordinary Tale of William Buckley tells the remarkable true story of the escaped convict who spent 32 years living with an Aboriginal tribe in south-eastern Australia before white colonization. On a stifling hot Christmas night in 1803, William Buckley, a young English convict, escaped from the doomed first settlement of Port Phillip Bay in South Eastern Australia, choosing to risk the unknown of the hostile Australian wilderness rather than surrender his freedom. His account of joining and living for 32 years with an Aboriginal tribe, is one of the greatest survival stories ever told.